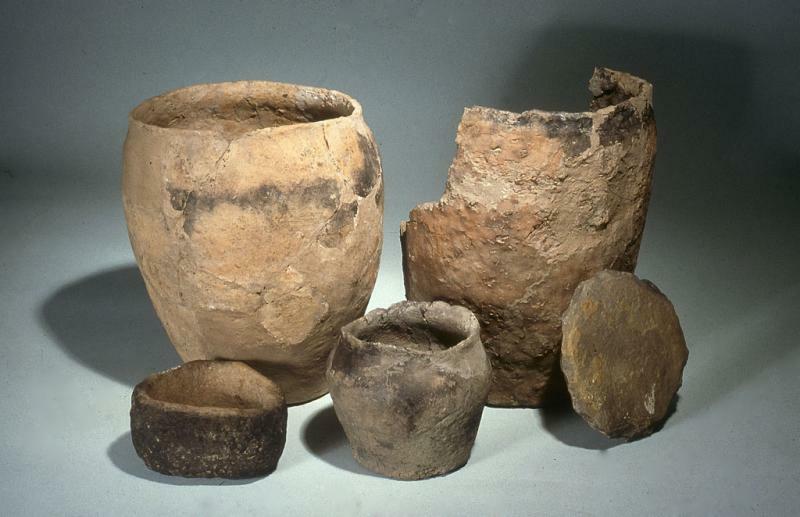 My previous two posts about ” Pottery in Archaeology ” covered the Neolithic period and the Bronze Age period In this post I will talk about the Iron Age Pottery found on various archaeologcal sites in Britain. Please remember as previously stated that these posts are intended for the beginner interested in archaeology and wishing to study ancient pottery. 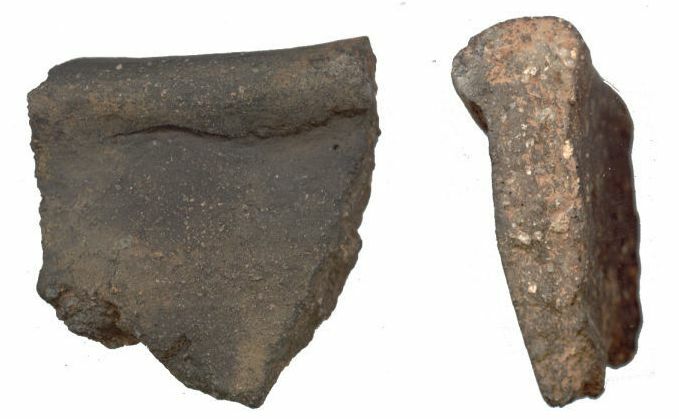 Archaeologists have found pottery sherds at almost all regions of Iron Age settlements around Britain and at this time pots were handmade from local clay and fired in bonfire kilns,or a shallow pit. The clay would have been mixed with ‘temper’ such as quartz sand, pellets, crushed burnt flint or fired clay (grog),even organic material like grasses. This helped to reduce shrinking and cracking of the pots when drying. The colour of the pot could be controlled by varying the amount of oxygen in the firing.People made different types of pots or decorated them in their own particular style in different parts of England so would not have been found on the same Iron Age settlement. 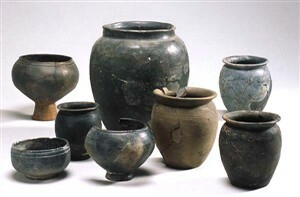 Iron Age people were not too particular about washing their vessels, which is why burnt remains of foods are found on the inside and sometimes the outside of the pot. The food was poured into a serving bowl for eating. Cooking pots were not usually decorated nor polished,whereas serving bowls could sometimes be decorated and were then polished by burnishing,this would be done by rubbing to achieve a glossy surface.The vessels produced during the Iron age consisted of ,jars ,bowls, beakers, cups and of course my favourite, the cooking pots. A BRIEF HISTORY OF HOW IRON AGE PEOPLE LIVED. 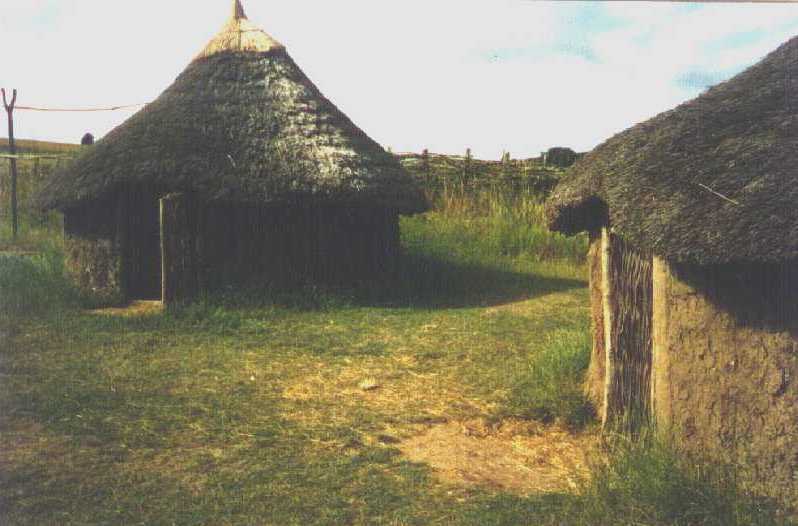 Iron Age people were farmers who lived in round houses within an enclosure Wheat, barley and beans were harvested in small fields and people reared animals such as cattle,sheep and pigs.They collected wood for fuel and building houses,they preserved their meat with salt. 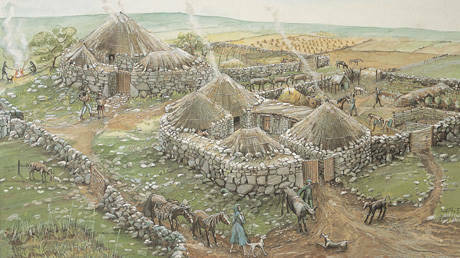 Most Iron age people lived on farms or in small villages,occasionally they lived in larger settlements,such as hillforts. This Iron Age village at Chysauster in Cornwall illustrates a typical pre- Roman farmstead. Iron Age Round House Glastonbury. 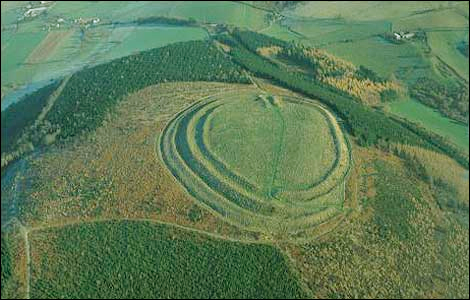 The most characteristic Iron Age feature in many parts of Europe are the Hillforts. Herefordshire has around forty hillforts which range in size from the Credenhill at forty nine acres down to small earthworks of just an acre or two. The hillforts in Shropshire vary in size from Badbury Ring which encloses just 2.5 acres and the massive Titterstone Clee hillfort which covers 71 acres and is one of the largest in Britain. These hillforts so named because they were built on the top of hills to take defensive advantage of the landscape.There are thought to be more than fifty Iron Age hillforts in Shropshire. Old Oswestry Hillfort in Shropshire. A SHORT GUIDE TO IRON AGE POTTERY ( Three Phases) Early,Middle and Late. Early Iron Age cooking pots. Early Iron Age pot beaded rim. 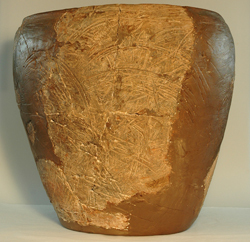 Iron Age Jar. Two Middle Iron Age Sherds from Worcestershire possibly Malvernian Ware. Iron Age pot from Bredon Hillfort. A selection of Black Burnished Wares. Below are drawings of Black Burnished wares Courtesy Hereford & Worcester Archaeology. (6) Tubby cooking pot with vertical and horizontal burnishing. (10) Cook pot with sinuous profile. Decorated Black Burnished Wares consisting of a selection of storage jars bowls and dishes. In this post I have included as many Iron age pottery vessel shapes as possible, which should enable the beginner to carry on his/her interest. .A good start is to join an Archaeological or History group who usually carry out field walking excersizes looking for broken pottery sherds.If you are lucky enough as I was some time ago to find a rim sherd which led to my interest in ancient pottery, you can follow up your own research and discover whether the sherd belonged to a cooking pot, storage jar or bowl. Good luck. Look out for my next post on Pottery in Archaeology. Hi Janet, Can you first tell me is this Wales in America or England ? Hi, i was wondering if you could tell me when the ‘Early Iron Age cooking pots’ and the ‘Early Iron Age pot beaded rim’ is dated from, where they were excavated and when they were excavated. Thankyou! 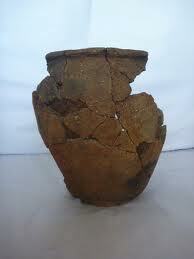 Hi Maddy I will e mail you soon regarding your questions about Iron Age Pots. O.K. Hi, just to ask again, could you tell me where the ‘Early Iron Age cooking pots’ and the ‘Early Iron Age pot beaded rim’ was excavated, when they were excavated and when they date from? The information is for GCSE course work and would be really helpful to receive the information. Its okay if you do not know, but would be helpful if you could tell me if you don’t know. Thank you and sorry to ask again! Hi there Arthur. If you can post a picture on this blog maybe I can help. But I don’t promise as it is very difficult when I haven’t the actual piece in my hand. Also it is possible that it may be a replica. Good luck anyway. Good luck with your class Kathy will contact you further by e mail. I’m trying to date a burial at Blewburton hillfort. The site dates throughout the IA, but the last phase is believed to be 1c AD, which is what the human/horse burials appear to belong. 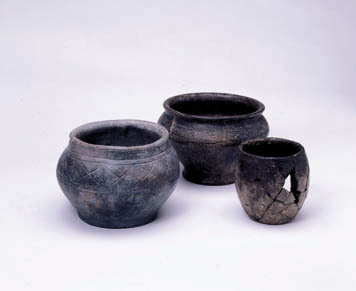 One burial included a burnished black pot – described on pp 30 and 47 (fig 17). Your blog here is saying these pots were in use during 3c AD. I’m hoping you might be able to lend me your expertise and comment on whether you think this pot is also 3C AD? Your help will be much appreciated, and duly referenced, of course.